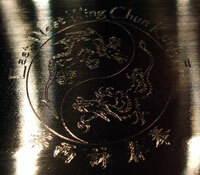 Wing Chun Kung Fu is a Chinese Martial Art from Canton Province, China. According to legend, it was created by a woman to defeat physically stronger and faster opponents. As Bruce Lee's original martial style, it is now one of the most popular forms of Chinese Kung Fu practiced today. Based on simplicity, efficiency and directness, Wing Chun's basics are easy to learn and apply. What is East-West Wing Chun? A derivative of Wing Chun Kung Fu as taught by Sifu Lo Man Kam, East-West Wing Chun seeks to maintain the traditional foundations of its predecessor while seeking innovative ways to apply its principles to modern combat. Contact Jasan Fujii for more details. Now available in North America, official Lo Man Kam Wing Chun T-shirts. Contact Bradley Temple at: wingchun@cox.net. 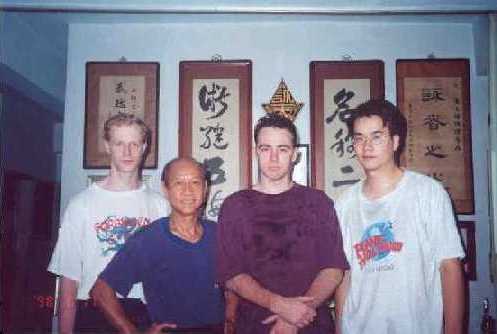 (From left): Bradley Temple (Las Vegas), Sifu Lo Man Kam, Nicholas Veitch, John Kang; at Sifu Lo's school in Taipei, Taiwan.